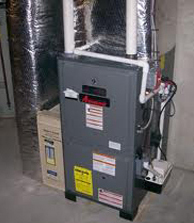 In St Paul if a furnace is aged, requires frequent repairs and results in high energy bills due to its poor efficiency, installation of a new furnace is often the best choice. Converting from a standard 80% efficient furnace to a 98% efficient furnace will not only save the homeowner 18% on their gas bill but will also provide better comfort and quality of air since high-efficiency furnaces circulate air throughout the house at a better rate. A recent customer of Mill City Heating & Cooling was tired of pay high energy bills and not having consistent and comfortable warm air. Her old furnace was constantly cycling between being on and off, causing the house to either be hot or cold. Her furnace was at the end of its 20-year life cycle and needed frequent repairs. The best solution for her was to have an Amana AMVM97 98% efficient furnace installed, as this furnace is equipped with a variable speed motor and a modular gas valve. This combination allows the furnace to burn fuel at a very low rate while steadily moving air, creating a climate where the temperature stays relatively stable and very comfortable. It also saved her a considerable amount of money on her gas bill and came with a $500 rebate from Xcel Energy.